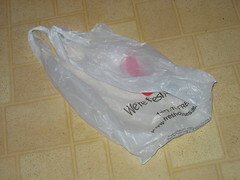 Plastic bags that you get from the grocery store or the drug store can be kept and reused instead of thrown out. They have many possible uses that make them handy to have around. From doggy bags to lunch bags, or garbage bags to storage bags, you can use them for a plethora of things. They can also be reused as grocery bags. Just take them with you to the store instead of getting more while you're there. Hey, I like your site. I have added you from my site. By Trina, at 8/25/2006 10:07 a.m. Even though it is kind of nice to have plastic bags to use when you need them, I think that it's very unpleasing to the eye to see a lot of plastic bags piling around in a corner of the house. Isn't it messier to have something that looks like trash lying around? By Anonymous, at 11/03/2008 5:04 p.m. When I was at uni, students would strip and weave the bags into mats. People also crochet for mats as well. By Charndra, at 12/16/2008 3:52 a.m. Plastic bags in general are petroleum based and should definitely not be eaten in any quantity. By Thomas Winther, at 9/10/2009 11:16 a.m.